U.S. Vice President Mike Pence, North Korea's nominal head of state Kim Yong Nam, and North Korean leader Kim Jong Un's younger sister Kim Yo Jong attend the Winter Olympics opening ceremony in Pyeongchang, South Korea February 9, 2018. Despite recent inter-Korean engagement at the Winter Olympics that has created a thaw for diplomacy between the United States and North Korea, the resumption of talks between the two sides remains elusive, former U.S. officials and analysts say. U.S. State Department spokeswoman Heather Nauert said this week the U.S. is interested in having “a preliminary chat” aimed at setting an agenda for more substantive talks over denuclearization of the North. The willingness to “chat” is seen by many experts as a subtle shift in how Washington should resume talks with Pyongyang and comes after U.S. Vice President Mike Pence’s attendance at the games in Pyeongchang. The Washington Post reported during his visit that Washington and Seoul had agreed on “terms for further engagement” with Pyongyang. Over the past two years, Donald Trump and his top officials have employed an unpredictable and often inconsistent blend of insults, overtures, and threats in dealing with North Korean leader Kim Jong Un. Here's a timeline of the events. The Trump administration says that the overall policy on North Korea remains unchanged, with its “maximum pressure” campaign in full swing, despite the flexibility on dialogue, a stance widely endorsed by former U.S. officials and experts in Washington. “I think it is a correct policy to be exerting maximum pressure with sanctions. I think the administration has made some progress on sanctions, and I would very much continue that,” said Christopher Hill, who led the U.S. delegation for nuclear talks with North Korea during the George W. Bush administration. Nicholas Eberstadt, a Korea expert at the American Enterprise Institute, believes increasing pressure will most likely increase the prospect for talks with North Korea. Some, however, argue the Trump administration’s strategy of employing both talks and pressure simultaneously may not be working given North Korea’s current nuclear posture. “In theory, it’s very easy to do both, but in practice it’s very difficult,” said David Straub, a former State Department official who is now with the Sejong Institute in Seoul. So far, Pyongyang has not shown any willingness to engage in nuclear talks with Washington. Bruce Klingner, senior research fellow at the Heritage Foundation, says the North’s stance casts doubts on the prospect of any future talks with the reclusive state. 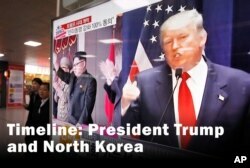 The former CIA analyst said Washington will not engage in negotiations with Pyongyang as long as North Korea “rejects the basic premises of the Six Party Talks, which is denuclearization of North Korea,” referring to the stalled multistate talks designed to persuade the North to abandon its nuclear weapons program. Joint military drills conducted by the U.S. and South Korea are also another point of contention between Washington and Pyongyang. Washington and Seoul delayed scheduled drills until after the Olympics; they are expected to resume the exercise in April. Robert Gallucci, the chief U.S. negotiator during the North Korean nuclear crisis in the 1990s, thinks the resumption of the military drills could close the opening for talks with Pyongyang. Hill, however, believes the U.S. should proceed with the exercises despite any concern, saying it is vital to the U.S.-South Korea alliance. “Alliances without exercises are like orchestras without instruments,” said the former envoy. Members of the North Korean Olympic delegation arrive at the Olympic Village of the 2018 Winter Olympics in Gangneung, South Korea, Feb. 1, 2018. The mood for dialogue emerged after North Korean leader Kim Jong Un reached out to Seoul to offer to send a delegation to the Winter Olympics. Kim dispatched his sister Kim Yo Jong to the games to invite South Korean President Moon Jae-in to Pyongyang. The North’s diplomatic initiative comes amid growing concern in Washington that Pyongyang is rapidly advancing its missile and nuclear programs. This week, U.S. Director of National Intelligence Dan Coates warned time was running out for the U.S. to act on the North Korean nuclear threat. “Decision time is becoming ever closer in terms of how we respond to this,” Coates said at a Senate committee hearing. Soyoung Ahn contributed to this story.